Golden Boy Elvis #4 - Misc. 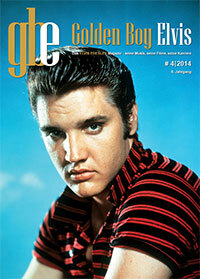 The fourth volume of the German "Golden Boy Elvis" magazine is out. This redesigned full color edition contains news, reviews and a series of articles. The cover tells you part of the focus is on "Charro" in text and images. But the latest releases, the Elvis exhibition in Friedberg, a detailed looks on the vinyl edition "Essential Elvis Volume 2 (Stereo ´57)", concerts on CD - focus on the months August and September of 1970 - and much more complete this edition. For details on the magazine and subscriptions go to our event section. Interesting cover; it almost doe not look like "E", but it is clearly him. Thank you very much, Sir..for the compliment..I`ll do my very best....promised..! This doesn't surprise me Ciscoking. I always know the best opinion to listen to when reading posts. Yours is always my first choice. Please keep posting. Many thanks. It`s a mag compiled with articles from fans who really know what they are writing about. I am the author of the Concerts On CD series. So i should know what I am talking about. A great mag...from fans to fans.. For sure the best in Germany..